Photo Credit: Masumoto Family Farm. Like all of us, writer and grower David Mas Masumoto is a product of his culture and his regional circumstances not to mention the owner of the famous Masumoto Family Farm peach orchards in the arid Central Valley of California. His love of the land punctuates his narrative as he shares his wisdom of organic farming, family ties and the story that is sustainable agriculture. The Masumoto family has farmed peaches, on an 80-acre patch of land south of Fresno, since 1948. After finishing college, Mas Masumoto returned to his family farm and a few years later bought 40 acres of land from his father. In the mid-1980s he made the decision to farm organically. Today, Masumoto and his family grow certified organic peaches and raisins. The peaches are sold locally and regionally through wholesale contracts with green giants like Whole Foods Market, to area restaurants (including origin of California cuisine Chez Panisse), at drop off points in the Fresno area and through their ‘adopt a tree’ program. Their raisins are sold through the Sun-Maid raisin cooperative. Masumoto’s respect for his land comes through as he talks about the growing region. 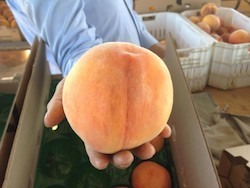 Masumoto peaches are grown using flood irrigation in well composted soil. The water comes from snow pack in the Sierra Mountains through a century old irrigation cooperative and through electric pumps. Pest control for Mas is a matter of understanding the life cycle of the pest and how that can be integrated into his growing cycles. Weeds that do no real harm are ignored and the focus is on sustaining and perfecting the flavor of the fruit trees. Peach farmers are their own breed, according to Masumoto and fruit farming is very different from vegetable farming. “When you grow fruit, because you’re dealing with perennials, you can’t change your mind as quickly. You can’t decide to grow something else for a few years; you’re stuck with the decision that you made. Also it takes a while to harvest those crops,” states Masumoto. “If I planted a peach tree it would be three to five years before I even got the first crop and it wouldn’t start producing significantly for about ten years . . . Another difference is peach tree farming is more up front capital intensive because you invest your time, hours, money and you won’t get anything for years so it requires a very different management structure in that sense,” concludes Masumoto. Decisions are made as a family at the Masumoto Orchards using what Mas likes to call the “family model.” His daughter, Nikiko will take over the farm and his son Korio, currently away at college, also enjoys helping with the tri-generational family business. Masumoto has written several books on his experiences with peach farming. His latest book, The Perfect Peach: Recipes and Stories from the Masumoto Family Farm, is a collaborative effort with his wife Marcy and daughter Nikiko and comes out this June. For Masumoto, writing, family and farming are necessarily intertwined. “You could say because I’m a writer too, I work with a story perspective. To harvest each year to me becomes like completing a new book or beginning a new chapter in a larger book. It has its own rhythms and realities, differences and changes which I thrive on; I love that. Every year there are significant differences from the year before,” states Masumoto. Inspired by the works of Steinbeck, Berry and O’Connor, Masumoto has a great sense of place and that plays a role in the way he perceives his farming life. It’s all about the people, their connection to the land and the food that passionate labor can produce. When they first arrived in America, Masumoto’s grandparents were not allowed to own land. They were farm workers bringing their knowledge of the Japanese rice farms to the Central Valley. “Just two generations ago my grandparents were immigrants to an alien land. And how does that all unfold in the work that we do? It is a part of that larger story that has branded us, scarred us, wounded us and also motivated us to do what we do,” shares Masumoto. Unlike large agricultural operations, independent growers are physically tied to their land and that connection demands their full attention. “It’s the whole notion that what you are getting into is going to demand that you integrate all aspects of your life,” explains Masumoto. “Farming isn’t that 8:00am to 5:00pm job that you just drive to your work at the same time… and then go home at a set time. Nor is it a job where you’re going to say: ‘Okay how many days off do I get?’ It’s a total commitment I’m talking about,” shares Masumoto. For Masumoto, the future of small growers lies in the power of the people. “There’s going to be continued division between Big Ag and Little Ag. Big Ag is going to be driven more by economic factors where Little Ag is driven much more by values. Economics do matter, but with Little Ag a lot of the human relationships, the human capital and the social capital matter a whole lot. In one way it’s going to have more of these traditional relationships evolve where people know where their food is coming from; certainly local is going to be a certain element of it. I think with the type of small agriculture that’s going to happen, it’s going to be a new entry point for young people wanting to do something different,” states Masumoto.